New faces to Elgin, but Elgin isn’t so new to them. Little did they know they would someday make Elgin their home. 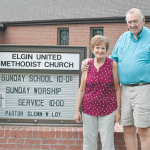 Reverend Glenn Loy, 79, and his wife, Judy Loy, 79, are new members to the community of Elgin as he took over Elgin United Methodist Church (UMC) as the new pastor last month. The Loys were living in Michigan before they decided to move to Nebraska years ago. In Nebraska, they had seven children, of which three sons and one son-in-law also entered into the ministry. Mrs. Loy has her RN degree and Reverend Loy decided to get his Masters in Theology. In Nebraska, they moved to a very familiar community to us, O’Neill, where he was a pastor from 1976 to 1983. Years later, the Loy’s decided to retire together and they moved to Florida in 2003. In Florida, they worked for Disney World for a little while, then moved on to a more important job, working for the organization GIve Kids the World from the Make a Wish Foundation. This organization is for kids and their families who have life threatening illnesses and it grants wishes to them. They stay in a village type area with parks around for kids to enjoy. They would often have Disney visitors to come and give the kids something to enjoy. After a while, Loy decided he wanted to come out of retirement and join the ministry last spring. 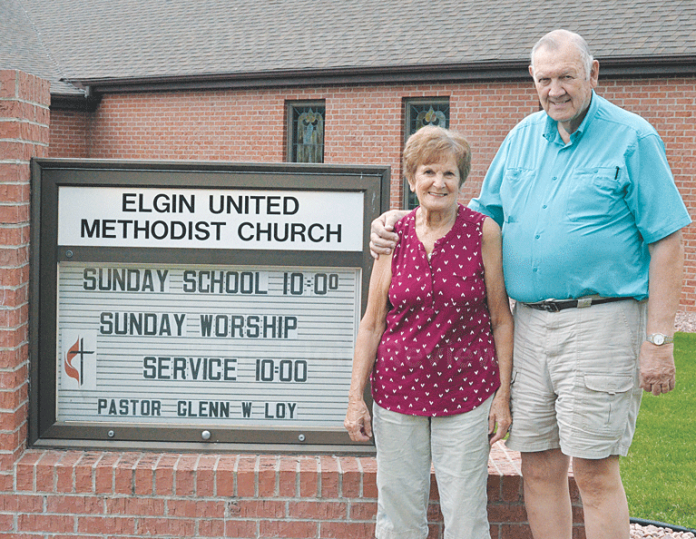 What a surprise, Elgin was in need of a pastor at UMC. They decided to accept the offer and come to Elgin. Approximately three weeks later, they moved all the way to Elgin with no furniture into a new house never seen before. Luckily, the Elgin Bargain Box has been a huge help for them, supplying them with whatever was needed at a low cost. Elgin was familiar to Rev. Loy as he passed through it every time going to Lincoln from O’Neill. “I don’t know why, I just always liked going to Lincoln this way,” he said. Living in a new community, Mrs. Loy said her first impression of Elgin is that it is “a gorgeous community” for them to live in. They were both pleased to see people take such pride in their homes. They have already taken trips around town, stopping at the Coffeehouse Café and volunteering at the Elgin Bargain Box and are excited to see more. The Loy’s hope to be more involved in the community by attending our local Wolfpack sports, like volleyball and football. They will fit in even more considering they are huge Husker fans. They said they can’t wait to get to know the people in Elgin, church members and the community as a whole, as they start to settle in. Through the church, Rev. Loy hopes to start a church class and a Bible study in September to help parishioners better understand what he is teaching. The Loys are very friendly and joyful people with great personalities that will bring a lot of light into our community. They said they are happy to be in Elgin and already can’t wait to see what life will bring them here.